"and the Lord shut him in." What a remarkable image of deliverance, divine protection and security. God was preserving the seed of Ancient Israel. Interestingly, upon close examination of Scripture one sees Noah and his family boarded the ark the very same day the biblical flood began. God wasted no time in executing His judgment upon the earth. "In the six hundredth year of Noah's life, in the second month, the seventeenth day of the month, the same day were all the fountains of the great deep broken up, and the windows of heaven were opened. And the rain was upon the earth forty days and forty nights. 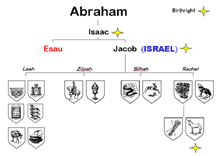 In the selfsame day entered Noah, and Shem, and Ham, and Japheth, the sons of Noah, and Noah's wife, and the three wives of his sons with them, into the ark;"
A number of fascinating facts are revealed in these verses. Not only did the Genesis flood include rain from above, but the "fountains of the great deep" as well. These were the subterranean water reservoirs which had previously watered the world. Rain had not been needed. However, these massive fountains burst forth from the earth's surface. Click on a link to visit that section on the Biblical Flood. Click to View Comments of Others! This plainly means the flood was accompanied by massive earthquakes, all over the world, occurring simultaneously. Scripture uses the phrase "broken up" to describe the rupture. This was sure to cause earthquakes of severe magnitudes. The Genesis flood was a total catastrophe of biblical proportions. Interestingly, the next time a worldwide earthquake takes place in the Bible is in the book of Revelation. The righteousness of Noah's family is also revealed. Scripture plainly states Noah, as did each of Noah's sons, married only one woman. This had to have been a very rare thing in the days of Noah. Noah and his family members were indeed righteous people. Noah and his family had no idea what was about to take place. The idea of rain in the antediluvian world was unheard of. Water had never before fallen from the sky. Noah did not know exactly how long they would have to live on the ark. He did not know what the earth would look like after the flood, or where they would live, or how they would survive. According to the text, Noah knew only what God had told him, nothing more. He was acting out of pure faith in building the ark. It was believing without seeing, and that is why Noah is one of the great men of faith. Seven days later the rains came. The Genesis flood "was forty days upon the earth". The waters were said to have "prevailed exceedingly". This phrase literally means, "were overwhelmingly mighty". The waters of the Genesis flood were more destructive than any force the earth had previously experienced. There is a rare phenomenon which occurs on the open seas. This happening was legendary, until recent. Rogue Waves are waves which have reportedly reached over 200 feet in height. These waves have toppled ships. They have threatened the largest vessels created, and severely damaged them. The waves of the Genesis flood were perhaps the equivalent of these rare Rogue Waves. These "mighty" waters were upon the earth for 150 days. The ark was built for stability, not steerability. 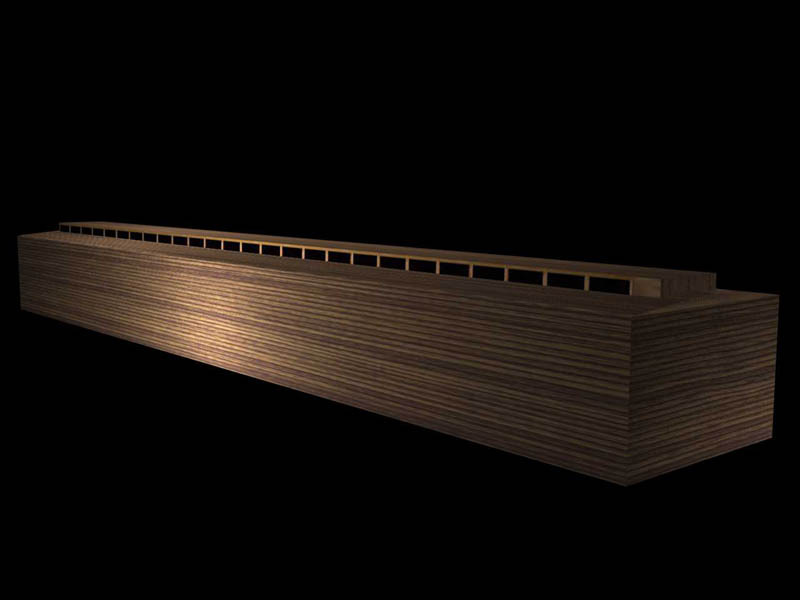 Thus, for 150 days the ark was tossed upon the surface of the earth. "And the flood was forty days upon the earth; and the waters increased, and bare up the ark, and it was lifted up above the earth." 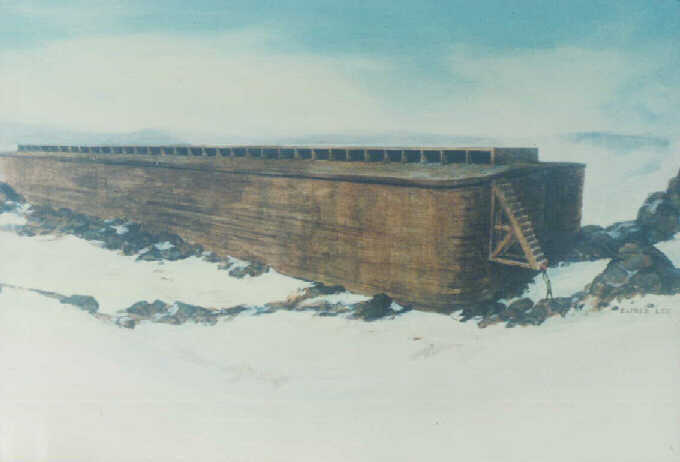 The Bible indicates the ark was at least 44 feet in height. The waters of the Genesis flood, thus, were at least 20 feet deep in the flood's initial stages. The waters, however, "increased". In the following six verses, the phrase, "the waters prevailed", occurs four times. Scripture leaves little doubt as to the severity of the flood. "Fifteen cubits upward did the waters prevail; and the mountains were covered"
Fifteen cubits was half the height of the ark (43.8 ft). 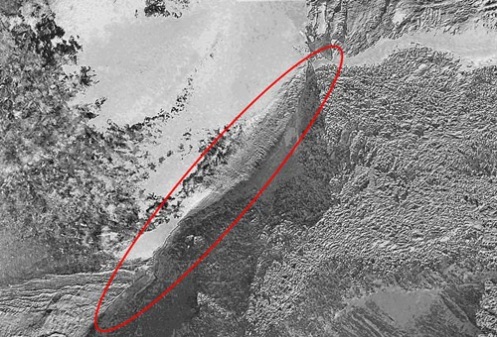 Thus, initially the waters rose close to 21.5 feet above the earth's surface. The ark was lifted up. The waters continued until "the mountains were covered". The whole earth was one big ocean. Scripture says the ark was "lifted up above the earth". Based on the fact the mountains were covered, we can deduct from scripture that the Genesis flood rose over 17,000 feet from the earth's surface. This number is based on the fact Mount Ararat would have been covered. Mount Ararat stands 16, 945 feet tall. The waters may well have been much higher. The Hebrew word translated as "covered", has also been translated in other instances as, "overwhelmed". In the first two chapters of Genesis 8, God puts an end to the Biblical flood. "And God remembered Noah, and every living thing, and all the cattle that was with him in the ark: and God made a wind to pass over the earth, and the waters assuaged. The fountains also of the deep and the windows of heaven were stopped, and the rain from heaven was restrained." For 150 days the flood waters rose upon the surface of the earth. However, at the end of those 150 days, God sent a "wind", and the waters "abated". 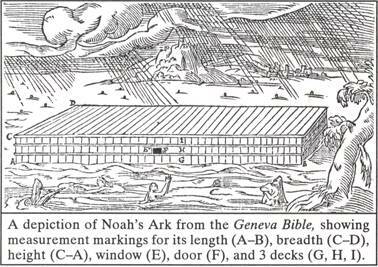 On the 7th month, on the 17th day of that month, after five months of battling flood waters, monstrous waves, confined quarters with thousands of animals and family, Noah and the ark "rested" on Mt. 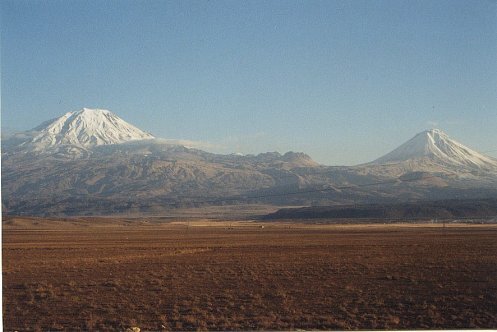 Ararat. Building upon the work of previous flood experts, historian Ian Wilson sets out to prove the historical accuracy of the Biblical flood in a unique and exciting book entitled Before the Flood: The Biblical Flood as a Real Event and How It Changed the Course of Civilization. Wilson builds his premise upon fascinating finds of a great flood in the Black Sea region; a flood so great it connected the Black Sea with the Mediterranean! Click on the link below to visit BarnesandNoble.com! Scripture indicates the ark rested on Ararat on the "seventeenth day of the seventh month". 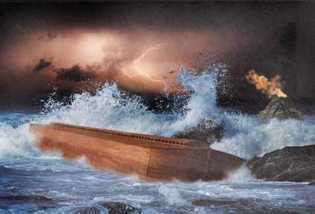 For five months the ark had been battling the waters of the Genesis flood. All that Noah and his family needed now was dry land. Based on the Biblical details, one can gleam the following chronology. The ark rested on Mt. Ararat five months to the day from the onset of the Genesis flood. On the 264th day of being on the ark, Noah sent out the raven. The raven is a scavenger. The earth was surely littered by dead carcasses, and the raven would have no problem setting down upon them and feeding. Noah, thus, knew land must be revealed if the raven did not return. It did not. So, on the 271st day since the onset of the Biblical flood, Noah sent out the dove. The dove would not touch dead carcasses, thus Noah was searching for clean ground, possibly. The dove was unable to find "rest for the sole of her foot", and returned to the ark. Seven days later, Noah sent out the dove again. On the 278th day since the flood began, the dove returned with an olive leaf in her mouth. Noah knew the waters had abated. God had made peace once more with His creation. Noah wanted to make sure things were safe, so he took extra precaution. Instead of dismounting the ark at once, he waited another seven days and sent the dove out once more. The dove never returned. The waters of the Genesis flood had receded enough to where vegetation was able to grow to support bird life. Noah knew the time was rapidly approaching when they would face the New World. Noah waited yet another 29 days before opening the covering of the ark. Though they had been stationary for over 150 days, nobody had attempted to really gaze outside the ark. Noah had relied on the birds, and God. Thus, when Noah removed the covering of the ark, and peered upon the New World, it must have been so with extreme uncertainty, and required a great deal of faith. Though the waters had receded, Noah felt it was still not safe to disembark. There still must have been a lot of water on the surface of the earth. The dry land was perhaps barren, forbidding, desolate. It was a lifeless earth. Noah and his family surely must have possessed a sense of eeriness in the thought. Fifty-seven days later, 371 days after the Genesis flood began, Noah and his family left the ark and encountered the New World. In all, they had been in the ark a grand total of 53 weeks, or 371 days. Though they were likely glad to leave the cramped confines of the ark, they were undoubtedly cautious and guarded about what the New World would hold. Though it is impossible to reconstruct the exact nature of the antediluvian environment, Scripture does shed some light. The firmament in the sky held back the waters, separating waters in the heaven, from the waters of the deep. This firmament prevented rain, and combined with the water from below, treated the earth as if it were a giant greenhouse. The earth was watered from below, and the water above basically cooled the earth. This system had been drastically altered, and consequently, the entire earth was drastically altered as well. Noah and his family would have noticed the surface of the earth was covered by much more water than before the Biblical flood. The land area had been drastically reduced. 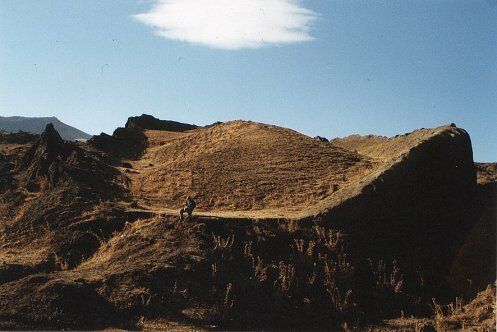 Not only this, the mountainous terrain would have been made much more rugged than before. Some of these rugged mountainous areas would be uninhabitable. With the loss of the firmament of water in the atmosphere, radiation from the suns rays would penetrate to the earths surface for the first time. Drastic temperature changes would be felt for the first time. Certain regions would now possess different weather conditions. Storms, winds, rains, and snow would now battle man in his attempt to farm and cultivate the land. Overall, the earth was far less hospitable to man now than in had been before the Genesis flood. This becomes plainly evident in the significant reduction in the lifespan of men in the post flood world. Within only a few generations, the lifespan is reduced to less than two hundred years. Before the Biblical flood, this was the prime of one's life! One year and seventeen days after God told Noah to board the ark, He told Noah to come out of the ark. Noah at 601 years of age, along with his sons, Shem, Ham and Japheth , and all their wives and families, walked out of the ark. They were to face a world that was completely different than the one they had left behind one year earlier. They were the lone survivors of the Genesis flood, and they alone would inhabit the earth. Ancient Israel tradition has it that they descended from Mount Ararat, and settled on the lower slopes of the northern side of the mountain. From this point on earth Noah's family migrated outwards, some staying nearby, others farther away. The geography of the post flood world was totally different. The Genesis flood had drastically changed the shape of the landscape. Noah and his family must have felt like they were on another planet. The history of Israel had to start with them. God had made a covenant with Noah before the flood had come. Now, God laid forth just exactly what the Noahic Covenant entailed. God blessed Noah and his sons, and gave them the order to be fruitful and multiply upon the face of the earth. They were to lay the foundation upon which Ancient Israel would be built. This is the second time God had given such a command to man. The first time was to Adam and Eve. As they were the only people alive at the time, God instructed them to fill the earth. Now, God had been forced to destroy the earth, and was starting over again with man. Noah was His guy to restart the human race, and He reaffirmed Noah when He told Noah to fill the earth, be fruitful, and multiply. God also set His "bow in the cloud", or a rainbow, as a sign that He would never again destroy the earth with a flood. God also gave them the order to establish human government. Ancient Israel law dates back to this passage, and capital punishment was the first law set forth to govern man ( Gen. 9:6 ). God also established the proper rites for sacrifice, namely that blood was solely to be used for sacrifice alone, not as food. It was under these guidelines and conditions that Noah and his sons set forth repopulating the earth and laying a foundation for the history of Israel. Noah then did a favor for all of mankind. He took one animal from all of the clean beasts, meaning beasts acceptable for sacrifice to God, and a beast from every clean bird, then sacrificed them as a burnt offering unto God. "And the Lord smelled a sweet savor; and the Lord said in his heart, I will not again curse the ground any momre for man's sake; for the imagination of man's heart is evil from his youth; neither again will I smite every living thing, as I have done. While the earth remaineth, seedtime and harvest, and cold and heat, and summer and winter, and day and night shall not cease." Do you believe the Biblical flood is fact, or fiction? Have you read of evidence concerning a world-wide flood? Share your thoughts, opinions, and questions concerning the Genesis Flood here! The theory of the flood and evolution - Paying attention to detail!